Visual discrimination is a tough for my students who struggle with decoding. Many of the substitutions I see with them include words with similar blends, vowels, complex sounds, or word chunks. During our intervention time, I like to dig deeper to find out what TYPE of visual errors the students are making so that I can then help them train their eyes to read more accurately! If you don't do this already... now you can too! 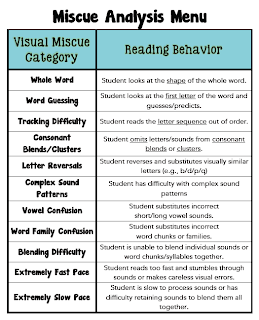 Use the "Miscue Analysis Menu" below for analyzing the visual miscues your students make. Tally them up and then use the information to drive your instruction! Are you looking for additional ways to practice visual discrimination and reinforce reading accuracy? Check out my blog post from last weekend here!